“Coming Up” short film was screened at the annual CYC fundraising gala last night in San Francisco. It was a fun event. It’s the first time we had that many viewers for this 2 month project. The film was well received. It’s not perfect because we still need some pick-ups for the film, but it’s a great achievement for everyone who involved in this project. We’re going to schedule a weekend of pick-ups to get all the missing pieces in the film. Then we can submit to film festivals. 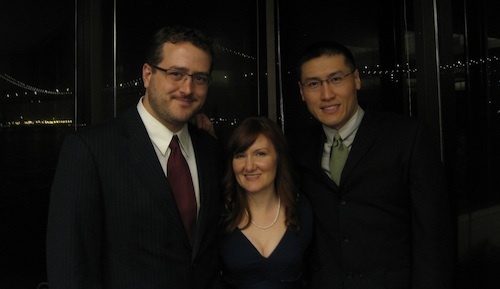 Here’s a CYC gala photo of “Coming Up” crew, film editor Jesse Kerman, screenwriter Christine Lee, and director Shaun Au.